Click Here Designs has been creating robust real estate website for more then 20 years and we have the personal understanding of the real estate market. We understand that real estate is about sales, and if your website is not producing website leads for your business then it is not an effect tool. We create real estate websites that assist you with lead creation and work as hard as your sales team to create a atmosphere where your clients feel comfortable with your business. Our real estate websites integrate with your IDX/MLS solution to offer your clients a full list of real estate options when they visit your website. Our custom creations give your clients all of the MLS offerings under your brand to ensure you do not miss a sales lead. Give Click Here Designs a call at 406-883-6237 to discuss how we can assist you with your Real Estate website. Click Here Designs can create a fully interactive website based on the popular Word Press solution. If you are looking for a website that includes an easy to use content management system then this might be the solution for your. Our Word Press website solutions utilize a system you are probably used to achieve the results you are looking for. 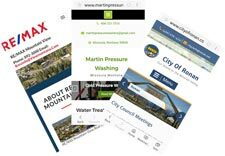 Take a look at some other Word Press Websites we have worked with our clients to rollout and maintain. Word Press provides a powerful and robust interface for maintaining an online presence that you will most likely be very happy with. Our lead programmer has been working with Word Press for more then ten years and can consult, or assist you with the maintenance of your website if needed. Give us a call at 406-883-6237 to see how we can help you with your website. All of the websites created by Click Here Designs are built for mobile. We not only make or website mobile friendly, we build our website for mobile devices. In the last ten years the trend has been away from desktop computing towards mobile, hand held devices that your customers can utilize while on the move and on the go. Click Here Designs has maintained a course ahead of the curve in mobile website development. All of our custom websites, as well as our word press websites are designed for mobile devices, as well as desktop computers so you can be sure that no matter your clients demographics they will be able to see your business in a positive interface and maintain a positive interaction. Your website experience is often the first interaction your customers have with your business. Click Here Designs ensures that the first interaction sets a level that showcases your business is serious about helping your customers with the product or service they are looking for. Click Here Designs is a full website solution. We have the knowledge and experience to assist you with the entire process of making your website appear online. Our lead programmer, Michael Hewston has a background in online security as well experience in online server systems, both Windows, Unix and Linux. Click Here Designs can work as a partner with your business, maintaining your online accounts to ensure costly downtime issues are avoided. This partnership ensures all of your services are professionally maintained without your business requiring an IT department. Give Michael a call at 406-883-6237 to discuss your website solution. If you need assistance setting up your domain name, website hosting or email, we can assist you. If you would rather have a company small enough to answer the phone on the second ring, but large enough to offer you the do it yourself website tools for domain registration, website hosting or email accounts we have a long list of online tools to assist you with doing your website right. Michael also has the ability to consult with you so you know you are making the correct decision with the do it yourself online tools you need to complete the job right. If you are a do it yourself website person and just looking for the tools you need to build and maintain an online presence we can provide that service as well. Click Here Designs can offer you all of the do it yourself website tools you need to build and maintain your own website. You can register your domain name, access tools to set up your own website hosting as well as manage your own professional email services, often for less money then the larger not to be named companies available to you online. You can see or complete list of do it yourself website products here. Our do it yourself website products come with 24/7 technical support so you can be certain you will receive the support you need, even at two in the morning.